David McIntire & Greg Segal - "Wonder, Doubt and Curiosity" / Greg Segal - "Phase Two: Selected Recordings 2001-2006" / Greg Segal - "An Awareness of Frameworks"
Among the releases from the past year from Greg Segal's PAle series we've got a collaboration with David McIntire, a compilation of solo works since 2001, and a remaster of his 2004 album An Awareness of Frameworks. If you're not already aware, during the 1980s Greg was the guitarist in the improvisational band, Paper Bag, who released several albums on the SST label. Though David McIntire played numerous times with Paper Bag and did duo poetry/guitar gigs with Greg, he never made it on to a released recording until now. 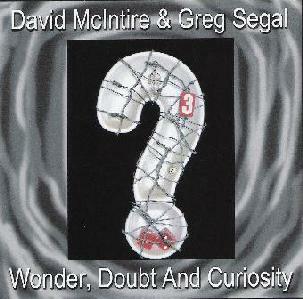 Wonder, Doubt and Curiosity consists of 14 readings David sent to Greg to provide musical backing. The result is a variety of music that works very well with David's spoken word, especially given Greg's obvious attention to the subject matter of each reading. We've got rock music, somber ambient music, soundscapes, experimental, playful for a love song, and some cool Beat styled jazz and psych rock. If you dig poetry and like spoken word recorded works, check this out for a deeply personal word and music experience. 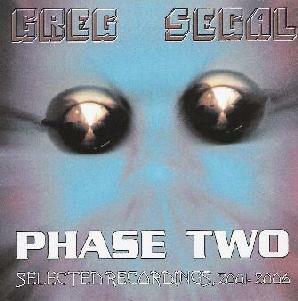 Phase Two: Selected Recordings 2001-2006 includes 14 tracks, each a selection from 14 albums released during this period. To say Greg has been prolific since the mid-1980s would be an understatement, and the diversity of musical styles he has recorded has been almost as extensive as his output. Just look him up on the "S" page in the Aural Innovations alpha index and you'll see what I mean. I'm a firm believer that variety is the spice of an artists' life, and diversity is something Greg takes seriously, as noted in the liner notes to this collection. And I think he's done a good job of providing an excellent overview of his work from the past several years to listeners who are either unfamiliar with his work or just haven't kept up with every release. Opening with the dreamy yet dark, atmospheric yet intense avant-space-prog of "Sahara, 1909"; to the sound-art explorations of "Interior"; to the free improv duo guitar with Eric Wallack; the Floydian styled rock of "Standard, Part I"… and on from there. Much of Greg's work in this period has been more in the experimental/sound exploratory realm, though Rock music in some form or another is never very far away. The accessible is often blended with more abstract sounds, and as a true rocker with a taste for the avant-garde, Greg excels at these combination/collage works. And we've got lots of prog rock influenced music too, though it's typically with an experimental edge. Just check out "Mutation Night", which is the most balls-out heavy rocker of the set, yet manages to drift into all sorts of exciting and off-the-beaten path nooks and crannies. Pretty adventurous stuff indeed. An Awareness Of Frameworks is the January release and consists of 23 tracks, most of which range from less than a minute to 2 minutes, but also include a couple of lengthier works. Utilizing electric guitars (6-string, 7-string, fretless), bass, acoustic and electric drums and percussion, recorders, bowed device, vocals and effects, the CD is like a collection of little ideas and musical considerations, all of which demonstrate Greg's long experience with adventurous rock music, drawing on his skills with sound manipulation and efx, and combining those with ambience and traditional instrument sounds. But as the veteran Segal fan might imagine there's LOTS happening here. We've got a variety of rock guitar workouts, oodles of fun efx, all manner of spaced out soundscapes and atmospherics, loads of percussion sounds and styles, and much much more. "Black Cavern River" is one of the tracks that takes a few minutes to develop. It does an excellent job of haunting soundscape creation and includes cool layers of deep dark droning waves over which spacey guitar notes play an ethereal melody. But there's a bit of a King Crimson-ish edge to the music too, which combined with all the ambience makes for a cool tune that steps way outside the box. "Spontaneous Knowledge" is a nearly 10 minute avant-progressive rock piece that begins with a dark thudding march and from there transitions through multiple segments that are less thematic changes then they are an exploration of atmosphere and efx. Rhythmic patterns are constantly on the move, working in tandem with the soundscapes, efx and traditional instruments to create a continually shifting glom of musical ideas that flow very nicely from one to the next. We've got bits of Ash Ra Tempel, classic Segal styled rock, and gazillions more. "The Great Theta Drive" is the closing track and a 25 minute epic. It opens as an old time heavy power-prog rock piece, but quickly descends into atmospheric territory, with bits of the King Crimson style we heard on "Black Cavern River", but also freakier elements that bring to mind Hawkwind's Space Ritual, David Torn's atmospheric jazz experiments, and a melting pot of ethnic and avant-garde influences. And like Spontaneous Knowledge", the music is continually evolving, taking on a life of it's own as it explores the cosmos, mutating and morphing. Things get very quiet at times, though even then a close listen reveals a busy complexity of outer space sound and efx creation. The percussion rarely lets up, keeping it all pretty firmly rock based throughout. Lots of harrowingly intense moments too. And right at the end Greg brings things to a close by returning to the power rock that opened the track. Absolutely outstanding and high on my list of all time Segal favorites. 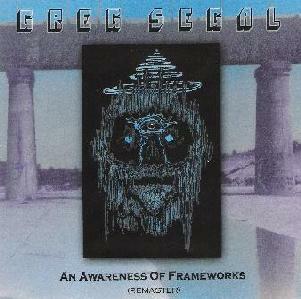 Overall, An Awareness Of Frameworks is a varied collection that will appeal to fans of Greg's exploratory In Search Of The Fantastic CD, as well as the many different rock structures heard on his early solo releases. For more information you can visit the Greg Segal web site at: http://www.gregsegal.com.